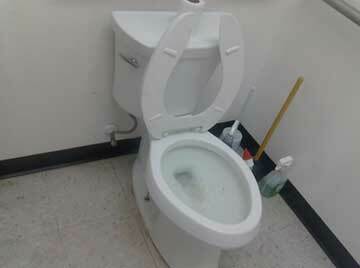 One of the most common reasons our plumbers get called is for clogged toilets. And yes, most homeowners attempt to unclog it first before they call us. It's true that there is no 100% foolproof method to EVER preventing a toilet from getting backed up but there are definitely steps that you can take to minimize it. Here is our list of the top 10 things that you can do to keep your toilet in tip top condition. An obvious tip is to NOT flush anything down the toilet other than human waste and toilet paper. Wet Wipes are NOT toilet paper and we recommend you avoid flushing these - even though many are labeled "flushable" - it's not true. Although wet wipes will eventually break down, the process takes a lot longer than toilet paper. Because it takes so long, they can easily accumulate and cause blockages which then clog your pipes. And when it comes to toilet paper - you don't want to flush TOO much down the toiet - that will get clogged as well. The best type of plunger we can recommend is a Flange Plunger. If and when you have to use it - this will give you the best results. Twice a year (every 6 months) lift the lid of your toilet tank and check to make sure that all the parts in there are working correctly. Keep your toilet and surrounding area clean. The cleanliness isn't as important as the inspection that you can do while you are cleaning. Again, checking to make sure there are no leaks, etc. Best cleaning supplies for your toilet are vinegar, baking soda or a mild soap. Chemical drain cleaners are not recommended because they can damage older pipes and septice tanks. If you're not sure if your pipes are old - then stay away from the commercial chemical cleaners. Toilet leaks can be indicative of a small blockage - so before it gets worse and you end up with a clogged toilet and overflow in your bathroom - get any toilet leaks looked at and fixed immediately. Proper Flushing means to flush the toilet periodically while in use. In other words - don't wait until you are finished and have put several wads of toilet paper in the bowl before you flush. Keep a small garbage bin with a lid close enough to the toilet so that you can place unflushable items in there. In general, you want to avoid toilet paper that is cushiony or markets itself as having "extra plush". Also, 1 ply paper will dissolve quicker so we do recommend that. If you find that your toilet gets clogged often, the problem may be more than just what you're putting down the toilet. The problem may be in your main sewer line. General maintenance of a sewer line recommends that it should be cleaned out every 18 - 22 months. Any of these will keep building up over time and generally, the longer you wait to get your sewer lines cleaned out - the more the project may end up costing you. If your home has a septic tank, then clogged toilet problems may be due to a clog or other problem in that septic tank. If that tank or the lines become clogged, then the tank will eventually overfill and everything will start backing up. We recommend that you avoid this problem by getting your septic system serviced on a regular basis. If you need help with a clogged toilet, call Atlantis Plumbing today at 770-505-8570. We are here for you 24 hours a day - 7 days a week!.